Born in 1978 in Buenos Aires, Argentina Javier Casabé, began his interesting career as a designer while he was only 13 years old. 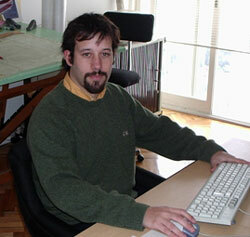 He graduated as a computer design technician in Industrial Design when he finished his Industrial high school, at Escuelas Tecnicas ORT in Buenos Aires. Javier also studied Graphics Design and the Universidad de Buenos Aires (UBA).He speaks and writes fluent English due to several years of study, obtaining Cambridge First Certificate in English. Javier’s passion for sailing started when he was a child, sailing in dinghies as well as big sailing boats, cruisers and racers. This early fascination and fast track experience, motivated Javier to study Naval Architecture at the Universidad Nacional de Quilmes, in Buenos Aires, Argentina. During, his first year at the university, he obtained the second place, of a "15 ft sailing boat design contest”, being part of a team of students in the development of a newly designed racing skiff. In 2002, Javier worked with Pro-Yacht Boatyard, a well known Argentinean shipyard, where they built the Quantum 26 (racer sailboat), and the Quantum 29 (Cruiser/Racer Sailboat ), designs from a very well known Argentinean designer. In 2004 found Javier working at the design office of boat builder “Compania Constructora de Embarcaciones” best known as "Aqualum Yachts", a very well known shipyard, with worldwide recognition. 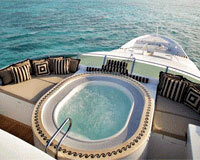 While with Aqualum, Javier participated in the construction of several Aqualum 35 Fly Bridge Motor Yachts. In June 2005, Javier became a team member at Gino Gandino Yacht Design, while still working toward his Naval Architecture Certification. In December, 2006 he graduated as a Naval Architect, now fulfilling the important role of Principal Naval Architect at the Gino Gandino Yacht Design office in Buenos Aries.